We went to the 2nd Annual Lighthouse Foundation Halloween party at the fancy bazillion dollar parking garage on Lincoln Road on Saturday, and the highlight was definitely the food. The venue was a much less interesting place to have a party than I was expecting. There wasn't really a good vibe in the huge concrete structure, which surprised me, because I park there when I visit my dentist, good ol' Dr. Shaw, and I love to look out from the top floor of the garage over South Beach. The views are spectacular. Part of it is that, if you've ever worked construction, you'll know that standing on concrete for several hours is exhausting. It's because concrete is very strong in compression, so it doesn't give at all the way other materials do. It's not very strong in tension though, which is why rebar is used with concrete construction. It keeps the concrete from falling apart sideways. It didn't cross my mind until we arrived that this would be an issue. Sure enough, all of our little feetsies were very sore by the end of the night. The other problem was that the acoustics were awful. You couldn't hear the music unless you were right in front of the dj, and there were very few speakers around the party area. That's pretty lame, and it turns out the reason is that the sound carries all over the neighborhood and the complaints start rolling in as soon as the party starts. By 1230am, at a party that was supposed to go until 2am, the music had been shut off. Music we could barely hear most of the night. So that pretty much sucked, and I find it unethical for a party venue to advertise that a party will go until 2am when they know the music's going to get shut off. Good thing we had old trusty Buck 15 to go visit. The new one is further down Lincoln Road, right next to the New World Symphony sort-of-Frank-Gehry-designed building. It seems a little smaller, but it's actually bigger than the former venue above Miss Yip's. Will take some time to get used to, but I like it. Back to the Lighthouse Foundation party. 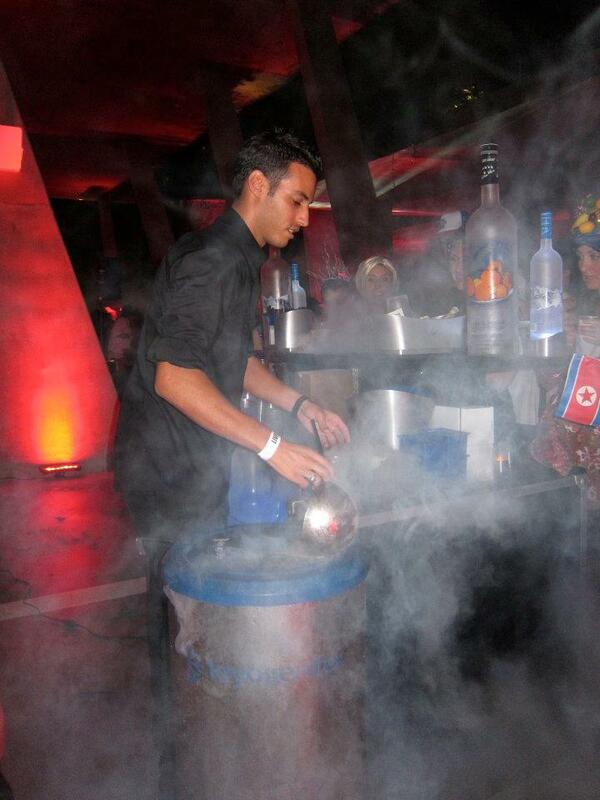 There were food and drink stations all over the place. The party organizers did a great job in that regard. The highlight of the highlight was the Rosa Mexicano table. They served their world famous guacamole, chips and a taco of cochinita pibil (marinated pork) and pickled onions. So delicious. Tiny bites of stuff really are the best. That's why the small plate movement is so awesome. Fratelli La Bufala had lots of baked and fried appetizers with ham and mozarella. Great snacks for soaking up the booze. One table had tiny polenta squares with a bite of filet mignon on top. That was a neat little snack. Don't remember the restaurant, though. Maybe the party website has a list of participating ones (yup, here it is). That would help. And someone else had cups of mashed potatoes with post roast. That's pretty much the best thing you can serve as an appetizer. They also had some mediocre mac n' cheese. So, whoever you were serving that, you get a B as an average of the two grades. The bars were quite adequate. I was expecting the lines to be outrageous, but they were short and quick. The servers did a great job that night. 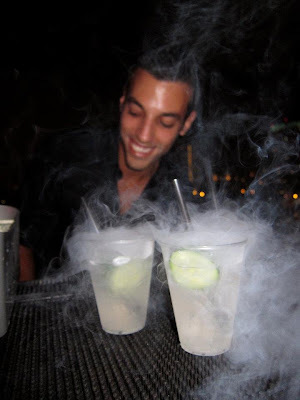 They didn't run out of anything I asked for, and they had a pretty cool Grey Goose vodka drink with cucumber and dry ice. As long as you didn't burn your fingers on it, it was a very cool, tasty and Halloweenie drink. So, the moral of the story is that the fancy parking garage is a crappy place for a party, even though you think it'd be totally awesome. The saving grace was that the food and drinks were good.